Hello, hope you all are good. This book has inspired me to take the pen and write my heart out on a subject which has bugged me for a long time. The result was my research in to it, (over the years) it forced me to read books on the subject by our Pakistani authors, mostly (high ranking) Military officers. And before I start it let me please say that the purpose is not critique or to start a tirade of words, neither is it to hurt anyone’s feelings. I came across this book on Facebook and got it shipped from UK, thanks to a dear friend (AJ thanks again 🙂 ). Some of the books that I have read on the subject are (in no particular order) Witness to Surrender, The betrayal of East Pakistan, Dead reckoning, Escape from Oblivion, The story of my struggle, A stranger in my own country , and a few more (over many years time). All the above mentioned books are from Pakistani authors save one from Sharmila Bose. This is book is different in many ways, because it a first hand of a junior leader (a Major’s rank) account of the situation that he encountered on ground. It is written is first person, amicably depicting the scenarios encountered by him. I haven’t read a book like this, because frankly junior leaders rarely write a book. The books written by officers of senior ranks have mostly discussed strategy and where it failed not to mention the political machinations at work, then. This on the contrary discussed operations at the tactical level, giving insight in to what actually happened there. Written in simple language, it is easy to understand. It gives a glimpse in to the lives of soldiers whose basic instinct in combat is somewhat animalistic, “kill or be killed!”. 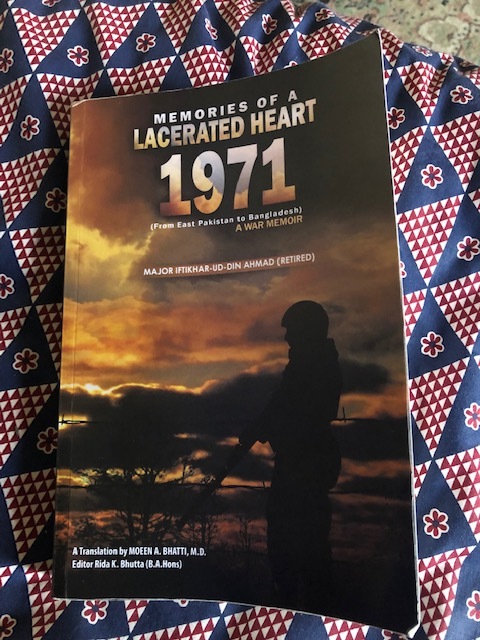 The author makes mention of the problems encountered in those days, of being outnumbered, of being under stress, of the Indian Army, of Mukti Bahini, he talks of patriotism. One can very much understand his feelings, the feelings of a Pakistani soldier while in combat trying to understand the mess created by the powerful and those in authority, thousands of miles away from home in a hostile environment, between enemies while trying to protect them (yes you read it right, read again 🙂 ). In that he tries to imagine and perceive things from his point to view. And I have to give credit to him, being a simplistic in nature is unable to understand the happenings around him, yet rightly so attributes this to political failure being given a military solution. There’s much talk of the war and how it unfolded before his very eyes, of losing friends, of staying away from family, of deceit , murders and survival. The author has been prisoner of war in India, after 1971 and was one of 195 officers from Pakistan who were going to be tried for war crimes. He talks of his experience while in captivity, of his religious beliefs, the hard and demanding circumstances, of failed escape plans, of rationed meals, and finally freedom. Each event is elucidated in detail. The book is based on his daily diaries which he wrote while in captivity. This books gives an insight in to actual combat as experienced by an officer on ground instead of the mumbo jumbo, by the senior officers who mostly have tried to absolve themselves from the whole saga. Are you Maj Iftikhar’s son? I really enjoyed reading this book.